Port of Amsterdam starts with sustainable film on patrol vessel. The film is being marketed internationally under the brand name Thorn-D. Breur, the managing director and owner of Micanti, and Eric Pieters, the firm’s commercial director and co-owner, can already point to their product’s proven performance. Two vessels – one a tug belonging to Dutch company BMS Towing and another located in Florida – have already been operating for some time after application of the antifouling film. The film has so far been tested up to 30 knots. It’s no surprise that Damen is involved in this innovation. 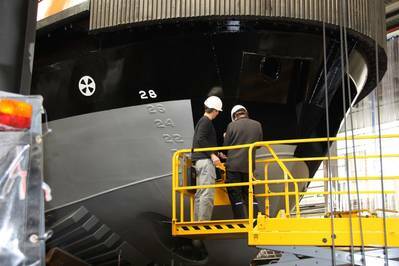 The Dutch shipyard has shown itself to be in the vanguard when it comes to environmentally friendly, innovative and cost-efficient shipbuilding. It will no doubt be using the Thorn-D antifouling film on more of its vessels.